However, the vote was marked by widespread irregularities and allegations of fraud. The final weeks of the election were wrought with allegations of fraud and the questionable application of campaign rules. The problems garnered a stern report from the Organisation of American States mission, which called for deep reforms to the country's electoral system. Fujimori won the first round with 39.6% of the vote and will face off against Kuczynski, also a strong supporter of neoliberalism. With 82.6% of the votes counted, Kuczynski was in second place with 22.1%, followed by Mendoza in third place with 18.3%, according to official election results released by the national elections commission. The campaign of Fujimori, the daughter of jailed dictator Alberto Fujimori, was marred by allegations of electoral fraud and criminal financial backing. Her runoff election against Kuczynski is on June 5. The left-wing Mendoza, who entered the race with negligible support, experienced a surge of support after her rivals were swept up in various corruption and electoral fraud scandals. The progressive candidate thanked her supporters for showing that “a different type of political campaign, based on conviction and integrity” was possible. “You have proven that the power of the people is stronger than the power of money,” she said. Kuczynski's campaign, meanwhile, has been set back by allegations his party is mixed up in the Panama Papers scandal. Although Fujimori has been the clear front-runner in Peru's election since the early days of the campaign, her political credibility has been tarnished by evidence that she bought votes with gifts and received funding from dirty money laundered through tax havens. As the daughter of Alberto Fujimori, many Peruvians also fear Fujimori will follow the footsteps of her father, whose decade-long presidency morphed into a brutal dictatorship in the early 1990s. Alberto Fujimori is currently serving time for corruption and human rights abuses. Close to 23 million Peruvians voted in the scandal-plagued presidential race. The high turnout led to long lines and delays in polls closing. The Ipsos results indicate that Fujimori's Popular Front party has won a majority in Congress, securing 60 seats. The OAS mission, meanwhile, called for an overhaul of the disqualifications system. It said that, in its current form, electoral authorities are not able to guarantee the political rights of voters or candidates. The assessment comes after OAS chief Luis Almagro warned of “semi-democratic elections” in Peru just a week ahead of voting day, saying that a failure to ensure candidates' participation would compromise the democratic process. Decisions by electoral authorities in the final weeks of the campaign raised serious questions about transparency, partiality and electoral fairness. In March, two presidential candidates were axed from the ballot. Both candidates' exclusion sparked controversy. Anti-Fujimori protesters took to the streets by the thousands to reject her campaign as illegitimate and accuse electoral authorities of bias. Protests also highlighted the painful legacy of her father's brutal authoritarian regime. The OAS mission report also analysed issues of political finance rules, voting abroad and the participation of women, Indigenous people and Afro-descendents in politics, calling for further reforms to improve the electoral process in these areas. The mission also condemned an attack on the eve of the elections that killed 10 people in a remote coca-growing region. Authorities blamed the attack on the Shining Path guerrilla rebel group, largely inactive since collapsing in the late 1990s. The attack may have helped boost last-minute support for Fujimori, already projected to win first place by a wide margin, due to her conservative tough-on-crime policies and claims that her father's key legacy was cracking down on terrorism. 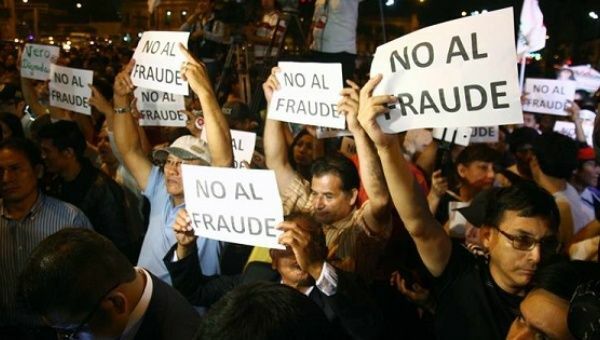 Anti-terrorism fear mongering is a longstanding cornerstone in Peru's neoliberal dominated electoral scene. In the region of Ayacucha, one of the areas hardest hit by the country's internal conflict and Fujimori-era “dirty war”, leftist candidate Veronika Mendoza came in first place with more than 25% more support than Fujimori.